The strength and prestige of the American presidency has waxed and waned since George Washington. Throughout our history, eight men have succeeded to the presidency when the incumbent died in office. John Tyler, Millard Fillmore, Andrew Johnson, Chester Arthur, Theodore Roosevelt, Calvin Coolidge, Harry Truman, and Lyndon B. Johnson all came into the nation’s highest office without being elected to it. Only Theodore Roosevelt would have been elected in his own right and only Roosevelt, Truman, Coolidge, and LBJ were re-elected. 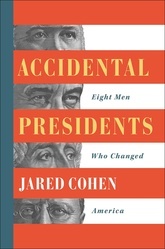 Accidental Presidents examines how these eight men vastly changed the course of our nation and the world. It also adds immeasurably to our understanding of the power and limits of the presidency in critical times.